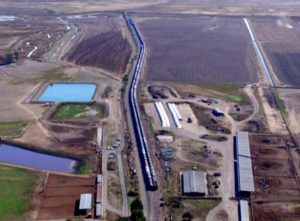 A petition seeking to halt the storage of more than 2 million gallons of liquefied petroleum gas in a rail yard in the Sonoma Valley near Schellville has gathered 350 signatures, organizers say. For at least two years, about 80 railroad cars have parked on the tracks three miles south of Sonoma Plaza, storing highly flammable gas. The Sonoma-Marin Area Rail Transit Authority owns the tracks and Northwestern Pacific Railroad uses them through an agreement between the two entities. In 2016, some Sonoma Valley residents protested when they learned that railroad cars holding 2.6 million gallons of flammable gas were parked south of Fremont Drive at the end of Eighth Street. Despite objections from Supervisor Susan Gorin, who represents the district, the agreement between SMART and the rail authority went through at that time, at least partially because the railroad is governed by a federal transportation board. Now, some Valley residents are protesting anew. “There are many people living nearby, many businesses, an airport, the Jacuzzi winery and (Cline Cellars). All these are in danger of an explosion that might destroy or damage their buildings and the same thing is true for the facilities along Highway 121 or Fremont Drive,” said Tom Martin, who has been shepherding the petition along. “Also there is a question of environmental damage to the wetlands in the area” should there be a spill, the Springs resident said. Martin visited Sonoma Plaza for a few hours every Tuesday during the Farmers Market between August and October and solicited signatures on his petition. The weekly visits have garnered 350 signatures since August. There is no online petition as of yet, he said. Martin’s group, Mobilize Sonoma, is pressing Supervisor Susan Gorin to get the tanks moved. Ray Mulas, chief of the Schell-Vista Volunteer Fire Department, said the cars are “durable.” He added, “There are two layers to these tanks. The outer layer is about 1-inch thick, three-quarters to 1-inch thick, and the inner vessel is three-quarters of an inch to an inch thick, and there is an eight-inch gap in between” the two layers. Bosco is an investor in Sonoma Media Investments, which owns the Index-Tribune. The North Bay doesn’t have an extensive pipeline system, so liquid petroleum and other fuels are transported by truck and by train, Bosco said.